wind on Wellington’s South Coast. 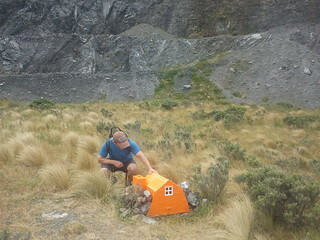 Earlier today, Eamonn and Steve and I checked out some of the Miniature Hikes huts that have popped up around Wellington, and which should be around until the end of March, with a parallel display in the Courtenay Place Light Boxes . It’s a very cool idea. The project has recently received some media attention , both in mainstream publications and also in some tramping and outdoor channels. The exhibition’s main website  gives a better idea of what it’s about, as does a short YouTube clip in which the artists explain what they’re on about. The idea is to “shrink the back-country into just Wellington”, giving people excuses to get out and find parts of Wellington’s back-yard away from the roads (but not too far away) which they might not otherwise have seen. Personally I hope that March won’t be the last we see of it. system to protect its log book. The mechanism has similarities to geo-caching , but is not the same. It’s certainly more fun than hanging around in a regular art gallery. 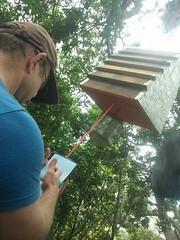 Each hut has a log book, inviting people to write their thoughts and insights, and to enjoy reading those of others. From what we saw today, the books are so far getting some high quality correspondence, moreso than I’ve often seen in some full-sized huts in remote places. 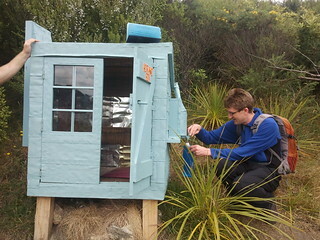 Each hut is also unique. They’re not all scale models of existing huts, or fake huts which would necessarily be remotely practical or useful if actually built to full size, but it would probably be less interesting if they were. Instead, they extrapolate and exaggerate the types of individual personalities which many real back-country huts have. With the log books, they’re inviting the same types of different-time-same-place interactions which people have when they write in and read each other’s entries in a hut book. The thought and detail put into construction just helps to make it more enjoyable, especially if you’re familiar with a few real back-country huts. For example, when Aoraki Biv, near Wellington’s suburb of Mt Cook, is listed as having a rain water tank, it actually has one and it works. This was helpful when we visited. If you’re keen to track these huts down, there’s a map at the end of the exhibition’s main web-page . The map also shows various other places where they’ve placed log books (without accompayning huts), just in case you feel the need to get out and express yourself. The whole thing is just a great excuse to get out and explore parts of Wellington when not out tramping. Copyright © 2008 Windy Hilltops. All rights reserved.